Though Apple hasn't been spared from the tech rout, recent news and reports mostly suggest consumer interest in its latest iPhones is healthy. The iPhone XS, left, and XS Max appear to be attracting healthy interest from consumers. As Apple's (AAPL - Get Report) shares have joined those of tech peers in selling off this week, news and reports about iPhone demand has remained mostly positive. Here's a look at some of the latest indications and what they might mean for Apple's September quarter earnings, which are due out after the close on November 1. On Thursday, top Apple contract manufacturer Foxconn reported that its September revenue rose 29.7% annually in local currency to NT$584.9 billion ($18.8 billion). That represents an acceleration from August's 25.3% growth, and the highest monthly growth rate recorded by the company in 2018. For the whole of Q3, revenue rose 27.7%. To be fair, Apple probably isn't the only reason Foxconn posted such strong revenue growth -- among other things, the company also seems to be getting a boost from strong data center hardware demand and a weaker Taiwanese dollar. And the fact that Apple's flagship iPhone launch happened in September this year, rather than in early November as was the case last year, probably helped some as well. At the same time, one has to think the fact that Apple is launching a cheaper iPhone in late October this year rather than September hurt Foxconn's sales in the quarter a bit. And 29.7% revenue growth for the month is clearly a big turnaround from the 3.7% decline Foxconn reported a year earlier. Foxconn's numbers weren't the only ones released this week that pointed to healthy iPhone demand. On Tuesday, Bank of America analyst Wamsi Mohan reported a survey of nearly 91,000 consumers done by his firm indicated "interest in upgrading to an iPhone rose significantly in recent months, with steady growth following the [September 12] announcements of the iPhone XS and iPhone XR." Mohan added that 33% of survey respondents said they planned to buy a new iPhone, compared with 15% who said they planned to buy a Samsung (SSNLF phone. He argued that the survey data, which also (not surprisingly) suggests iPhone customer loyalty remains strong, "points to a significant opportunity for growth in both China and India." Two weeks before Mohan's note, long-time Apple analyst Ming-Chi Kuo, who's had a history of making good predictions about Apple's plans, reported seeing strong early demand for iPhone XS Max. Kuo, who now works for a firm called TF Securities, estimated that initial sales for the 6.5-inch phone were three to four times those of the 5.8-inch iPhone XS. Kuo added that the 256GB version of the phone, which costs $1,249 in the U.S., was the most popular model. Though the ratio of XS Max sales to standard XS sales likely won't be so high over the long run -- initial sales of new flagship iPhones skew towards enthusiasts, and there appears to have been strong pent-up demand for a bigger flagship iPhone -- Kuo's note bodes well for sales of Apple's priciest iPhone, and by proxy, for iPhone average selling prices (ASPs). As I noted following the arrival of XS/XS Max reviews, the XS Max is well-positioned to be popular with owners of older 5.5-inch iPhones, since (thanks to its edge-to-edge display and lack of a home button) its form factor is quite similar to those phones. There has been one downbeat story of note about iPhone XS demand. On Wednesday, while discussing Tim Cook's latest visit to China, the Washington Post reported that initial iPhone XS sales in China have been "disappointing" due to the high price tags attaches to Apple's latest flagship phones -- prices that are meaningfully higher than in the U.S. due to local taxes. The Post stated that the XS Max sells for $1,850 in China. However, that appears to be a reference to the larger 512 GB model, which costs $1,449 in the U.S. The 64 GB model, which costs $1,099 in the U.S., goes for around $1,400 in China. It's worth noting here that the Chinese yuan's recent decline relative to the dollar could increase the pressure for Apple and other U.S. firms to raise their local-currency prices for goods sold in China. On the flip side, Kuo recently forecast that Chinese demand for the 6.1-inch iPhone XR, which starts at $749 in the U.S., will be stronger than year-ago demand for the iPhone 8 and 8 Plus, though it's worth qualifying here that pre-orders for XR won't start until Oct. 19th. Kuo added that local OEMs such as Xiaomi, Vivo and Oppo have been seeing weak smartphone demand. While there's still a risk that trade tensions could lead the Chinese government to call for boycotts of Apple and other major U.S brands, Beijing has refrained from making such a move to date. Can better-than-expected demand for Apple's latest iPhones allow the company to top analyst iPhone unit estimates? Considering how conservative those estimates still look, moderate upside seems possible. For the moment, the consensus is for Apple's iPhone unit sales to be up just 2% annually in the September quarter to 48 million, and for sales to be roughly flat in the seasonally big December quarter at 78 million. Judging by recent data and analyst reports, those numbers look beatable, even if the XS and XS Max's premium pricing restrains volume growth some. 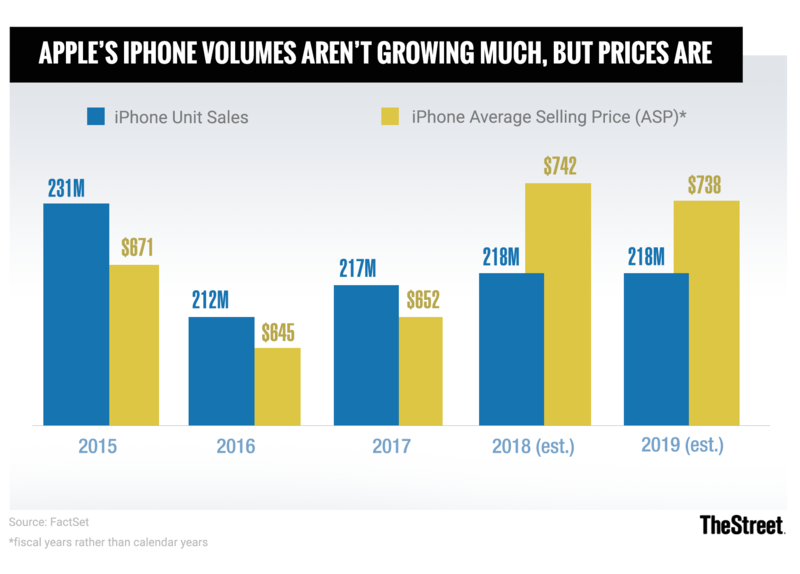 And if sales of Apple's new flagship iPhones are indeed skewing strongly towards the XS Max, that might spell some upside to ASP estimates. Following Apple's posting of a better-than-expected $724 iPhone ASP for the June quarter, the consensus is for a September quarter ASP of $738 and a December quarter ASP of $805. The December quarter is also a seasonally strong one for ASPs, since newer iPhones account for a large portion of the sales mix. The current December quarter consensus only represents a $9 annual increase -- that's understandable since Apple recorded some iPhone XS/XS Max sales in the September quarter. But that consensus could nonetheless could be topped if demand for the XS Max in general, and the 256GB model in particular, prove strong. We'll have a better understanding of how iPhone XS and XR demand is trending once Apple release September quarter report comes out at the beginning of November, and which should also include December quarter sales guidance. Strong iPhone numbers would give a boost not only to Apple's shares, but those of chip suppliers such as Skyworks (SWKS - Get Report) , Qorvo (QRVO - Get Report) , Broadcom (AVGO - Get Report) , Cirrus Logic (CRUS - Get Report) and STMicroelectronics (STM - Get Report) , whose shares have been pressured by China and cyclical worries.